Were there any flying animals during the Cretaceous period? The flying animals during the Cretaceous period were the pterosaurs, birds, and various winged insects. 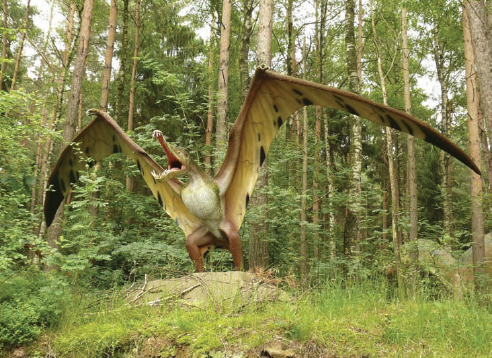 There were over 50 species of pterosaurs, and they were found everywhere except Antarctica. They all disappeared at the end of the Cretaceous period. The largest flying animal of all was the Quetzalcoatlus, a late Cretaceous period pterosaur found in Texas. This giant of the sky, though not a dinosaur, was comparable in size to modern small airplanes, with an estimated wingspan of 36 to 50 feet (11 to 15 meters). The birds and winged reptiles that emerged during the Jurassic period greatly diversified during the Cretaceous period. There were also species with reduced wings, such as the flightless, ground-dwelling Patagopteryx that looked like a chicken with very short wings; and the aquatic diving bird, Baptornis, which also had tiny wings, webbed feet, and sharp teeth. Winged insects also greatly diversified quickly during the Cretaceous period, probably in response to the arrival of flowering plants. The Cearadactylus was a fish-eating pterosaur that lived during the Cretaceous period in what is now the southern part of North America. There were over 50 species of pterosaurs (iStock).